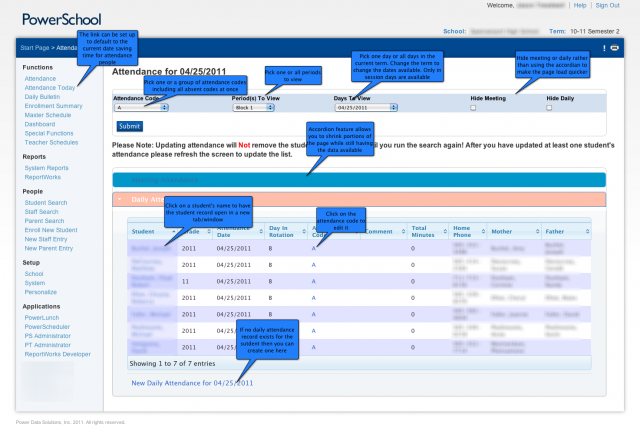 Attendance screen that allows for the search and edit of attendance records all from one screen. 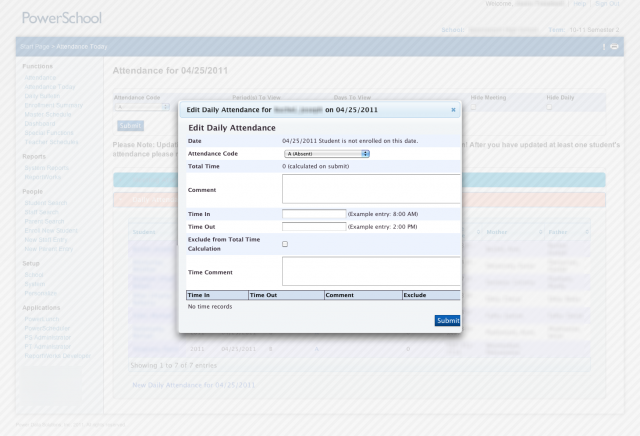 Users can search for attendance by code, all codes, daily, meeting, all present codes, all absent codes, etc. 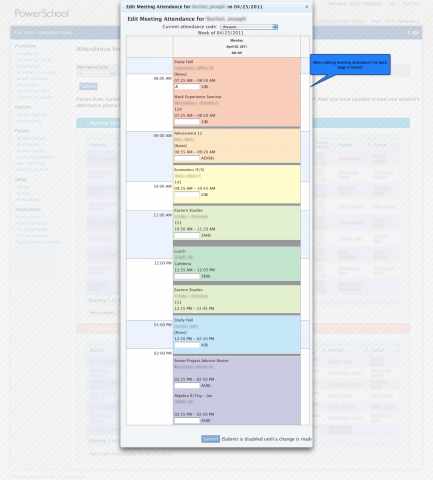 This plugin will add the misc reports to the custom reports bundle base. Note: the base plugin will need to be installed before you will see these reports automatically appear. Moving from legacy fields to database extensions is complicated. There are fields we aren't allowed to move, fields that were already moved, and fields that will be created by core migration 1 and 2. Looking at a list of legacy custom fields doesn't really tell you which ones are available for migration. 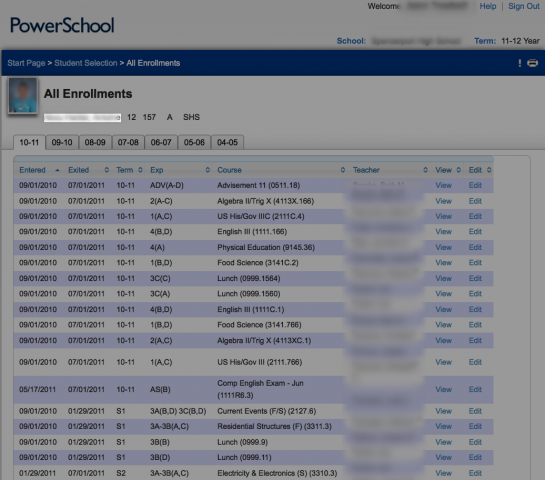 PDS Enhanced Legacy Fields is a customization that aims to help. 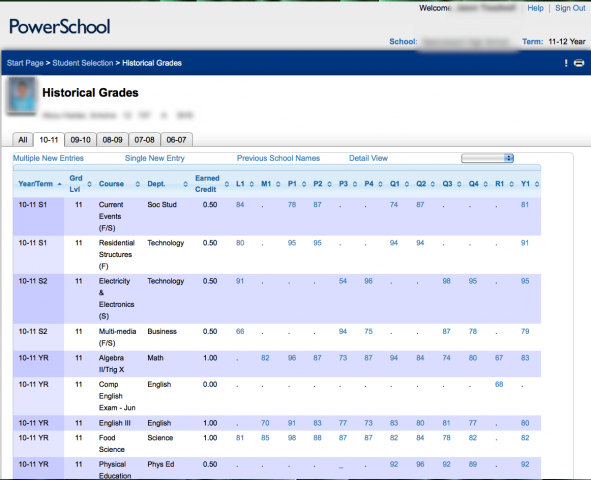 Having one spot for all the sections a student has ever been enrolled in is great, but after a few years that list gets really long. Especially if you schedule students in more than just homeroom each year. 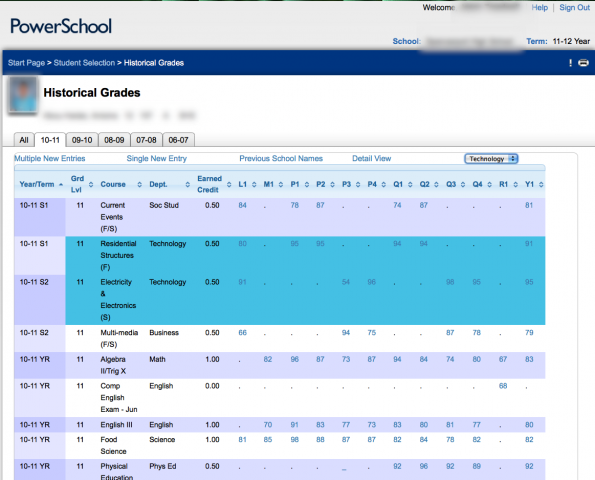 All enrollments tabs is a edit of the existing all enrollments page combined with the tabs feature of the reports page. Converted to a plugin. Also now using page fragments instead of customizing the page. 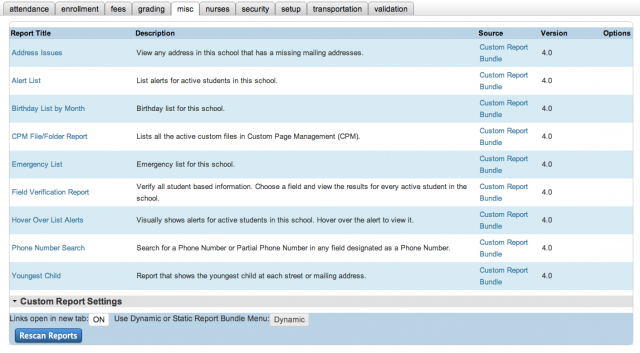 This plugin will add the incident reports to the custom reports bundle base. Note: the base plugin will need to be installed before you will see these reports automatically appear. The update of these reports from 3.x to 4.x was sponsored by Orleans Public Schools. Finally converted the old 3.x reports to work with version 4.x. 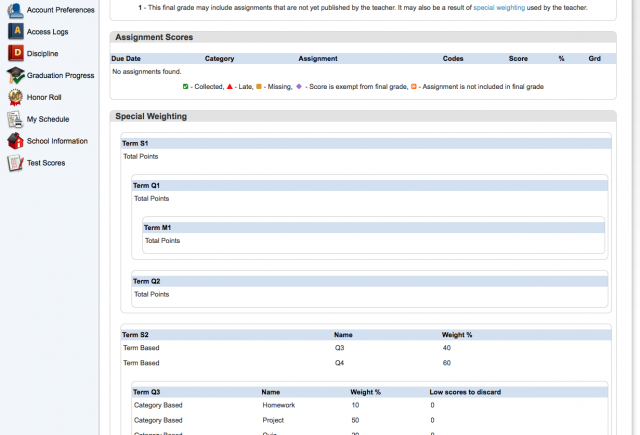 This plugin will add the validation reports to the custom reports bundle base. Note: the base plugin will need to be installed before you will see these reports automatically appear. 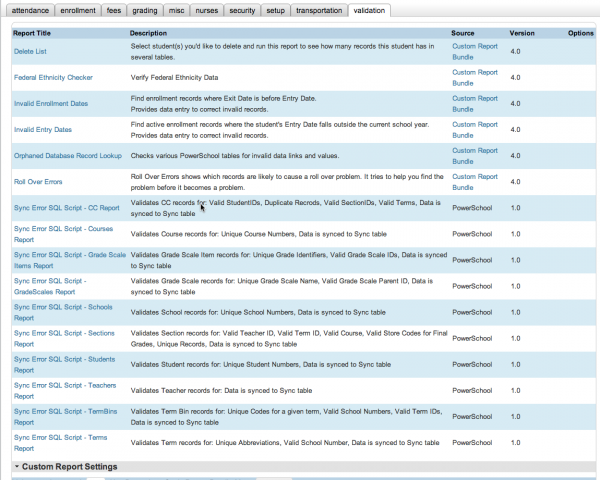 This plugin will add the transportation reports to the custom reports bundle base. Note: the base plugin will need to be installed before you will see these reports automatically appear. 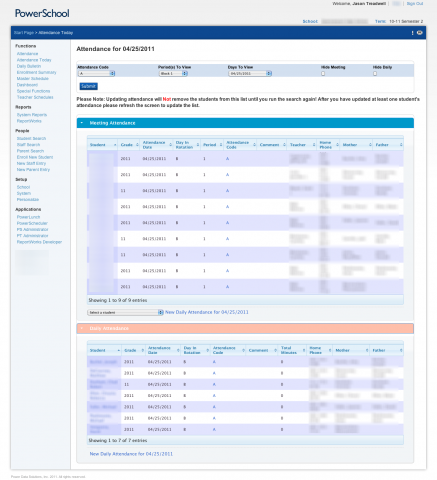 This plugin will add the security reports to the custom reports bundle base. Note: the base plugin will need to be installed before you will see these reports automatically appear.